Q: How do you transfer pictures to a pc? 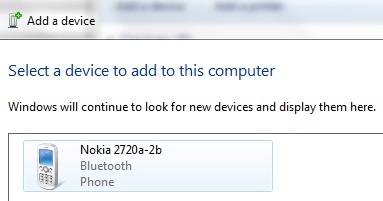 A: This Nokia is capable of Bluetooth 2.0 connections, so you can transfer the files. All you need is a Bluetooth-enabled PC. If your PC doesn't have Bluetooth built-in, you can get an adapter very inexpensively. Once you have the adapter plugged in and installed on your PC you have to pair the phone with the PC. 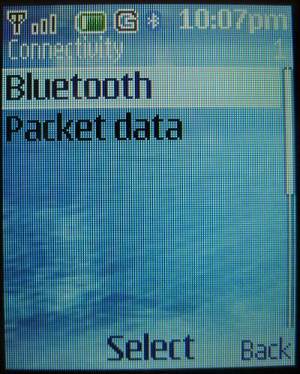 On the Nokia Gophone, go to Menu -> Settings -> Connectivity -> Bluetooth and turn it on. 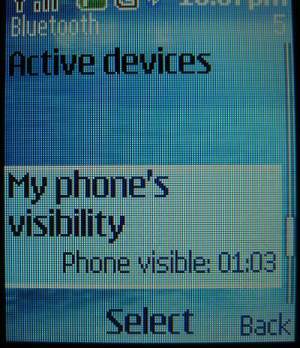 Then, scroll down to "My Phone's Visibility" and make it visible. If you select "Temporary Visibility" then the phone shows a two-minute countdown timer showing you how long you have to establish your connection. On your PC, choose "Add a Device" or similar command. Wait until the PC finds the phone and then select it. The phone will ask if you want to accept the pairing device. 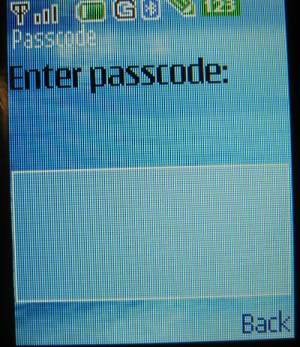 Once you accept, the connection, the PC will display a passcode that you have to enter into your phone. Once you enter the passcode, you should be connected. You can also choose whether to auto-connect to this device in the future. Once you've got your devices connected, you're ready to transfer your photos. Options -> Send -> Via Bluetooth -> Paired Devices - (Your Device) and click Connect. Your PC may ask you to accept the file transfer. Accept it and the photo will be transferred to the Bluetooth Exchange folder on your PC. To send multiple images, in the images folder, select Options and scroll down to Mark All, and then choose Send -> Via Bluetooth. That will transfer all your images sequentially. While it seems complicated, once you've paired the devices the first time, the next time it's very quick. Thanks! That's a lot more helpful than my service provider (Fido in Canada), who I bought my Nokia 2720 from. They told me that there is no way of transfering photos taken with it to a pc or anything else! Return to Nokia 2720 Gophone.